Ballymena United manager Glenn Ferguson. Press Eye. Glenn Ferguson insists he won’t rest his key Ballymena United players with next weekend’s League Cup final in mind. 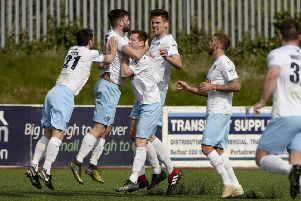 The Sky Blues boss played a fringe line-up in United’s final game before last season’s Irish Cup final but insists he won’t do the same for this Saturday’s Danske Bank Premiership trip to Portadown (3pm), just seven days ahead of the WASP Solutions League Cup tussle with Cliftonville. “The cup final won’t even be mentioned this week - the most important thing for us at this moment in time is to get points on the board. “The strongest team that we have that we think can do a job at Shamrock Park will be playing and we’ll worry about the cup final from 5.30 this Saturday night. Ferguson is likely to hand a debut to new signing Eamon McAllister at Portadown but the winger is cup-tied in both the League Cup and Irish Club, having played in both competitions for former club Ards. With several of United’s long-term injury absentees now back fit, Ferguson has opted to let several of his young players spend the remainder of the season gaining experience at Championship clubs. Midfielder Eoin Kane has joined Ballyclare Comrades, while the manager’s son Matthew and goalkeeper Macauley Cairns have gone to Dundela. * Seven Towers Supporters’ Club transport to Portadown leaves Henry Street car park at 1.30pm, while anyone using Towers transport to the League Cup final must contact Tommy Patterson to purchase a bus ticket.